As an entrepreneur, we know it’s hard to manage everything that’s thrown your way. That’s why we provide the resources and HR and payroll services you need – putting compliance fears to rest. Don’t tackle the challenges of starting your own business alone. Paycor partners with entrepreneurs to mitigate risk, increase efficiency and improve productivity so you can focus on what’s important – growing your business. Our resource center features articles to help you prepare and support your efforts. Hear how other entrepreneurs are partnering with Paycor. Entrepreneurs leave the details to Paycor so they can focus on operating and growing their business – and they wouldn’t have it any other way. Meet other entrepreneurs that partner with Paycor and trust our service and our solutions. "It used to take me hours to do payroll. As a small business owner, I had no time at all for my family. With Paycor, I feel like I've gotten my life back." It’s a question that’s on the mind of every owner. Take three minutes to better your business with Paycor’s HR compliance audit. Because one misstep could cost you thousands of dollars in fines, it’s critical to know where you stand and what you can do to help ensure you’re covered. Find perfect solution for your business. Paycor provides HR and payroll solutions to prevent compliance missteps and help you manage your workforce. Let us help you find the perfect solution that fits your business. Sit down for a cup of coffee and join our thought leaders as they discuss current business trends and offer expert advice during Paycor’s Coffee Break Webinar series. And if you can’t attend in person, we’ve made it easy to watch on your own time with on-demand recordings. Take 30 minutes to better your business. Helping our clients get the most out of our service and keeping them ahead of the curve is key to their success and ours. 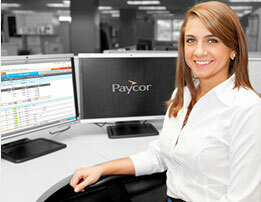 From helpful training to frequent webinars, Paycor provides answers every step of the way. Introducing the easy-to-use tool that gets new hires up to speed fast.